Seattle Police detective Mike Ciesynski, now retired, was assigned to the unit of homicide for 22 years, 12 of which were in the cold case unit. Ciesynski was asked to review the Kurt Cobain case in 2014. On the 25th anniversary of Cobain's death, Ciesynski shares what he found. When the public information sergeant summoned me to his office in 2014, I thought he was going to ask if I would be willing to speak to a writer who wanted to talk about one of the serial murder cases I worked on. Instead, the sergeant greeted me with a funny smile: "Hey Mike, the chief would like to take a look at the Kurt Cobain suicide and get your thoughts," he said. "April 5th will be 20 years exactly, and that's why the chief thinks it would be a good idea to take a look at it since we're starting to get media inquiries." I told him I did not have any thoughts, since it happened right before I got to the homicide. But that was the assignment. I had no involvement in the original investigation aside from taking a recorded statement two years after Cobain's death. I also knew that a couple of rolls of 35mm film, backup photos from the death scene, were never processed. 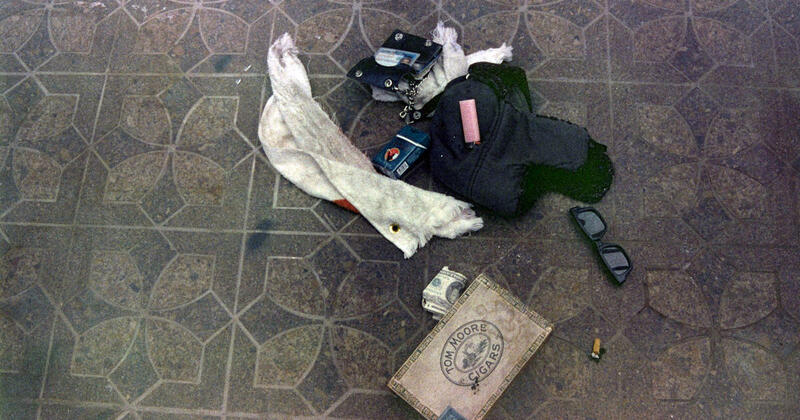 This April 1994 photo provided by the Seattle Police Department shows items found at the scene of Kurt Cobain's suicide, in Seattle. The film was not developed until 2014. One of the original case detectives, Steve Kirkland, had passed away, as did the scene sergeant Don Cameron. Steve and his partner Jim Yoshida were the best homicide detectives in the unit. Jim was retired, so I gave him a call and told him what I was up to. Jim told me that Courtney Love was very cooperative throughout the investigation and that they spent a lot of time on the case. Dr. Nikolas Hartshome was the assistant medical examiner who conducted the autopsy. Nick was a great guy who passed away in 2002. When I received the autopsy report, I remembered leaning back in my chair and giving a "whoa" after seeing the morphine level Kurt had in his system. It also showed track marks, and there were several grams of black tar heroin left in his kit. Black tar heroin is found on the west coast of the Mississippi as compared to Brown or white heroin found in the eastern part of the U.S. I knew I had to develop the film. The supervisor of the crime lab grimaced when I explained it was 20 years old. The movie gets damaged with every passing year and becomes very brittle – I know from working old cold cases – and I was not about letting the movie get anymore fouled on my watch. We would have to take the film to the Sheriff's photo unit since Seattle Police Department stopped developing 35mm film since transitioning to digital. Once released, it was obvious the film had deteriorated, leaving a green tint to all of the photos. I also decided to have a look at the shotgun. Some conspiracy theorists had suggested that the Seattle Police Department had turned the shotgun over to Courtney Love or had destroyed it. When the rusted weapon was brought to me and after I inspected it, I had a warehouseman photograph me holding the weapon. Did I find any earth-shattering evidence that would change the medical examiner's conclusion that Kurt committed suicide? No. In fact, I found the evidence that strengthened that finding. Why would a millionaire musician with and the bright future of unlimited potential take its own life? I wish we could ask all the others who have done so who have looked outwardly "fine." "He or she would never commit suicide," is one of the most common things we hear when working a case that turns out to be a suicide. It has been my experience as a homicide detective that depression is the most common underlying reason people commit suicide. Mike Ciesynski retired from the Seattle police department in 2017 after serving 37 years. Mike was assigned to the homicide unit for 22 years, 12 of which were in the cold case unit. After retiring, Mike wrote his first book on the first serial killer case, about a killer known as "Chilly Willy," who was the first serial killer ever charged in Seattle. The soon-to-be published book is about the murders of three women in an area known as "The Jungle."